This trip is a total of 12 to 13 hours with 5 to 6 hours fishing walleye and salmon each. Trip starts at 9:00 AM for walleye on the Bay of Green Bay. 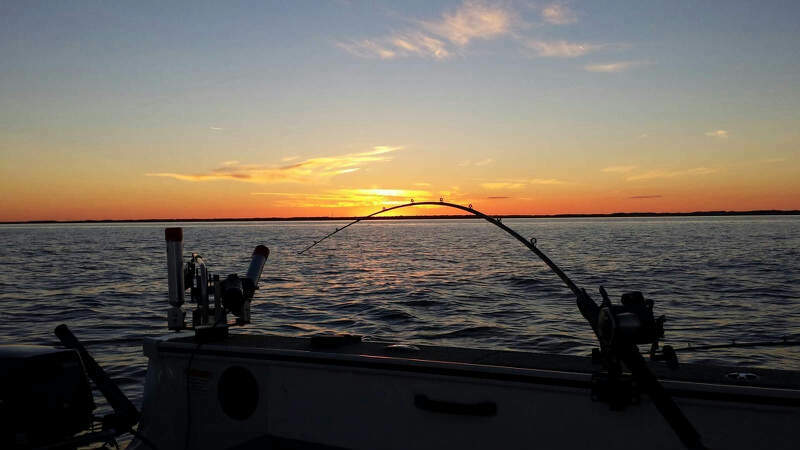 We will fish for 5 to 6 hours for walleye, return to port for travel and lunch (not provided), and then to Lake Michigan for an evening Salmon trip which ends 30 minutes after sunset. Multiple trip packages are available with lodging at area hotels in Green Bay, Algoma, or Sturgeon Bay. Please contact Captain Ryan for more information on package pricing or multiple trip discounts. All trips require a $100 deposit to reserve date. All deposits will be refunded in full if you cancel within 14 days of your scheduled charter. If the Captain is forced to cancel your charter due to inclement weather, your deposit will be refunded or applied to a different day if you prefer. Please call us with any additional questions, and we look forward to fishing with you!